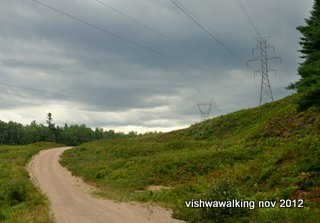 The long and winding road to the cabin (10.5 km) also buzzes from high tension wires. It's a scorching hot blight that stretches across the landscape. 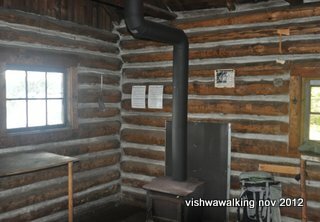 This is a basic cabin on a remote lake in the south of the park. Park officials say it takes about a day to canoe in, starting at the Shall Lake Access Point (#17) in the south-central part of the park. My hiking partner and I took the logging road, which is accessed from the Basin Lake Access Point (#19). Before setting off to the access point, it is necessary to first book the cabin through the provincial park booking centre (you cannot book the cabins online) at 1-888-668-7275. Phone directly to the park at 705- 633-5572 if you want to talk about specific details of the cabins. General information on both the provincial site and the Friends site is very good; however, you could end up in a frustrating webpage-link cycle if you try to book the cabins on line. You can't actually do that, but finding that out is not so easy. Just make a call. 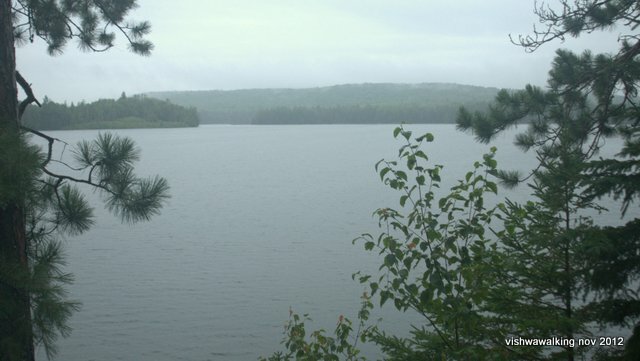 Once on your way, you have to pick up your permits at Bonnechere Provincial Park on Highway #58 on Round Lake (north off Highway #60 west of Killaloe). Along with permits, you need clear instructions how to get to the cabins, two permits (one for your car dash and one to keep on your person and — very important — the combination to the lock on the cabin door. We almost missed the last step (not knowing a combination was needed); sometimes people on the front desk have not been made aware of all the steps involved in booking the cabin. We also found out that the "logging road" that we were meant to walk was actually on a power line; this we were not told on the phone. With permit in hand, we set off. Go a few metres north on Highway #58, turn left on Turner's Road and keep driving until you meet Basin Depot Road on your right. It's a long drive; pehaps 45 kilomettres to the parking spot (I didn't clock it, so this could be very wrong). When you pass the actual Basin Depot (the log cabin), you're still 30 kilometres from the cabin. You'll know you're close when you get to the power lines. This was a surprise for us. We knew there were power lines, but as the road opens onto the power lines we began to get depressed. The website lists an 8-kilometre road that you can bike or hike. It's actually 10.5 kilometres from the parking spot to the cabin, plus two or three tenths of a kilometre on the little road to the cabin, so you're closing in on 11 kilometres in all. Much of the road is in the open swath of land that the power lines cut through. Walking it on a hot day would be torture, especially since there's not much in the way of picturesque landscape to take in. second day it looks simply misty and wet. When we came in on a hot afternoon, we were facing a 10.5-kilometre walk with our full packs. The scenery was no hell either. If you stop on the road, the hydro line buzzes nastily. It's a disquieting artificial sound in otherwise quiet surroundings. At the 10.5 point a road cuts off to the right and back in a northeasterly direction. There's a rude sign in the shape of a house that tells you you've got the right place. With the hydro lines behind us, the cabin was a treat. It looks out on beautiful McKaskill Lake, which we had all to ourselves. day was perfect, with low clouds hanging just over the trees on the far hills. 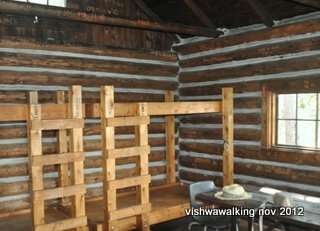 The cabin itself (as advertised) was basic: two sets of bunk beds, a wood heat stove, a picnic table and a chair. There was no sign of the pail or wash basin that was listed as being in the cabin, but no worries. It was a fine home for two days. Inside the cabin: two sets of bunks, a picnic table, one chair, a wood stove and a couple of rudimentary tables. 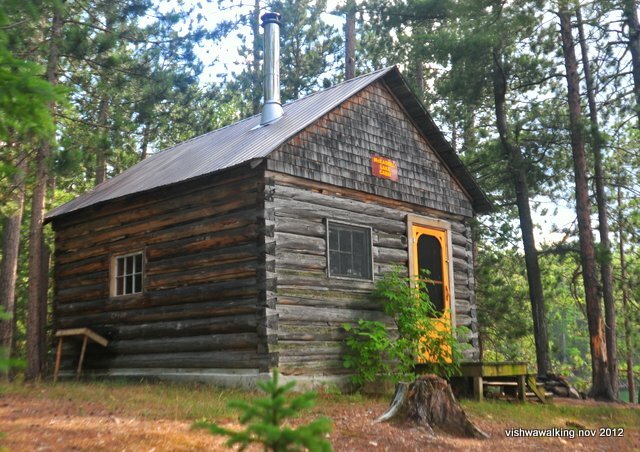 According to the Friends of Algonquin, the cabin qwas built in 1932. Between 1993 and 1996 it got extensive repairs. It definitely has character and despite the rainy weather on our three-day/two-night trip, we enjoyed coming back to the lake and the cabin. Walking opportunities around the cabin are dismal. The portages near the cabin are overgrown and not much fun when you're soaked after five minutes of wading through thick undergrowth. The portages are also badly marked; I suspect that canoeists don't make a habit of passing this way. Our two trips from the cabin involved long stretches on the logging road. We met one ranger in a truck; other than that, not a soul. Mist on the far hills on a rainy day at McKaskill Lake. It rained fairly steadily both of our full days out. We had to give the area a low rating as far as trails, walking and picturesque views (outside of the lake itself) were concerned. We decided the cabin would be ideal for anyone wanting peace and quiet to get a project done -- say a writing or an art project. 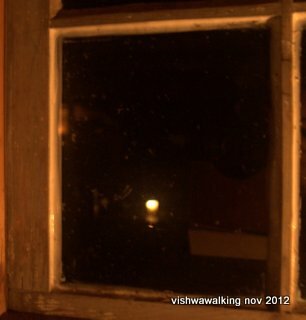 Left: a candle reflected in the window and below, two on a little shelf. The candlelight made for perfect evenings. With the rain pattering on the roof we were amply amused in our cabin. There was a firepit just outside the cabin. On our first day in, there was a complete fire ban. After the nights rainfall, the ban was lifted, but either way, the weather was against us as far as using the pit was concerned. On our way out, we stopped by the old post office near Basin Lake and walked to the campsite at the top of the lake, where we had lunch. The trail is an old double-track road; again, nothing too extraordinary. The camp at the top of Basin Lake looked out on a nice reedy bay, but it's not a site I'd pick to stay long in. There's an island offshore at the north end where there's a campsite. I read one chronicle where a camper took out over 100 beer bottles from the island. We also saw pop and beer cans on the trail. As areas become easier to access, they attract more of the moronic crowd. Left: Basin Lake, the only building still standing of an original 10. There's a guest book just inside the door of the building. Below, a little gravesite in the bush across the road. According to a chronicle from Ontario Abandoned Places, "As of 1890 it had a blacksmith, post office and the Basin House bar and accommodations. There were 10 buildings in total. The logging enterprise was run by the McLachlin Company, then by the McRae Company and finaly by Shoosplin Woods Ltd. By the village's last years in 1960 there were 18 buildings and a population of 100 workers. "Only 2 buildings from the by-gone era survive. 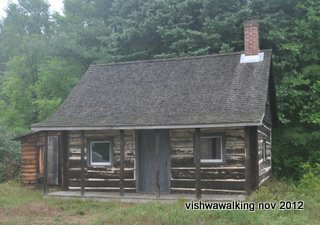 One of these, a cabin, is the oldest structure in the whole park. 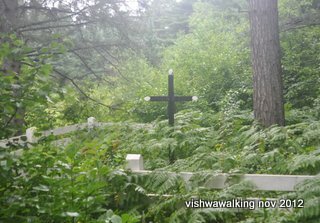 Three small cemeteries in the forest still exist too. The stories of the fates of these buried men date from an era in which dyptheria and drownings were commonplace." We could find only one surviving building and one gravesite. There are archeological digs in the area and there are signs of that nearby. Rating: As far as the walking goes, it's a one walk-dude rating, I'm afraid. The cabin itself? Well, I don;'t have a cabin rating system, but it's a pretty cool cabin. 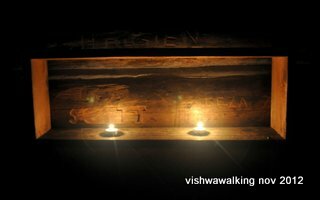 If you don't go for the walking part and you like rustic cabins, I reccommend it.